HP 300s+ Plus have Text Book Display (TBD) which allows to see the question as you see them on the paper. It has 315 built-in functions and energy-wise solar power. 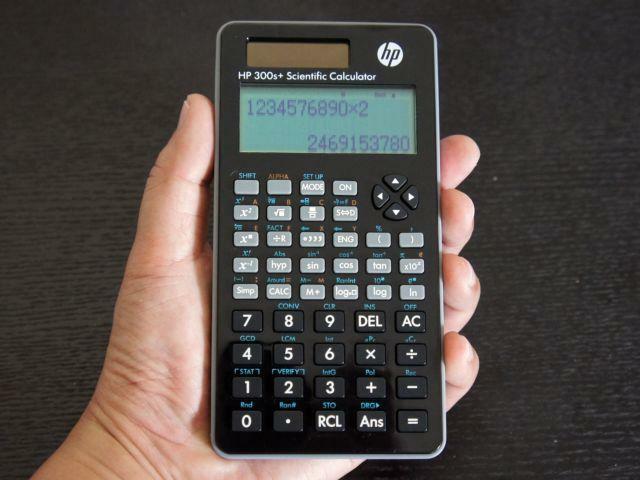 This calculator is ideal for students to do there difficult math problems in general math, pre-algebra/algebra, trigonometry, statistics,geometry, biology, chemistry, physics, earth science subjects. Display: Textbook Format Display (TFD), 31 x 96 pixel LCD display. Math functions: Sign change, +, /, -, x, =, square root, %, fractions, mixed numerals, fraction to decimal conversion, sexagesimal (degree, minute, second), variables (A, B, C, D, X, Y), trigonomic, inverse trigonometric, exponential, logarithmic, powers, factorial (! ), absolute value (Abs), random number, rounding, polar-rectangular conversions, permutation and combination. Advanced features: Streamline prime factorization, whole number division, fraction reduction and GCF/LCM calculations with built-in tools. Perform decimal and hexadecimal conversions. Convert from decimals to fractions. Make metric and imperial unit conversions. Easily enter one and two-variable statistical data with table-based editor. Calculate mean, standard deviation, variance, regression analysis and more. Added features: Navigation pad, memory calculations, snap-on protective cover. Power System: Solar powered with 1 x LR44 battery as back-up. Auto-power off 5 to 10 minutes. Size (L x W x D): 166 x 80 x 16 mm. What's in the box? Calculator with batteries, user guide, snap-on protective cover. Tagged By: Battery - Replacement Chart.